My name is Simon Purbrick and I am deaf and I have been a member of the club since June 1990. 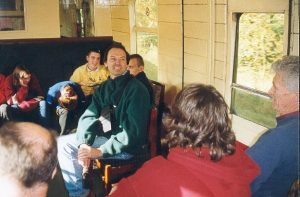 I am a railway enthusiast and one of my main jobs of helping run the club is organising day trips to preserved railways. I’m interested in how railways try and make things easier for disabled people, like level access, disabled toilets, access to trains via a ramp and the way staff help them. Many of the railways try and preserve the past and in the old days there was less things to help disabled people. There were no toilets, no special carriages (expect for brake coaches) and no lifts at main stations. 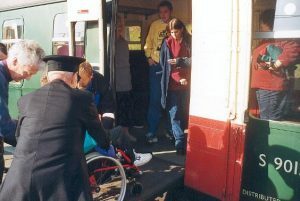 Now most preserved railways have level access, disabled toilets, ramps and the most important thing for disabled people to travel and enjoy is specially designed coaches with ramps or lifts fitted. We have been to the Swanage Railway (twice), Isle of Wight Steam Railway (twice) and Didcot Railway Centre (once). 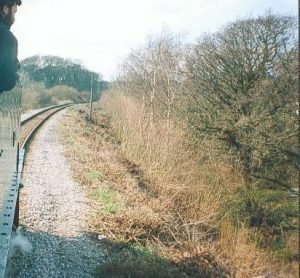 During one of the Phab holidays in Wales, a group went to the Gwili Railway. 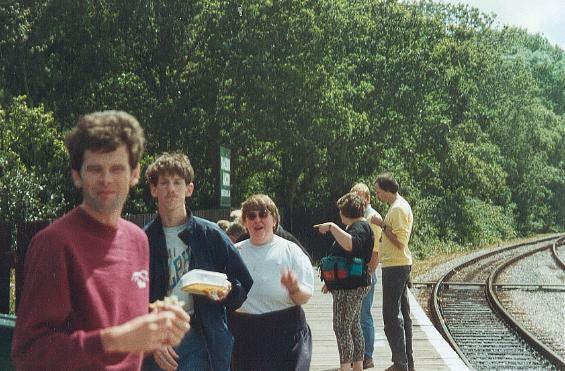 The first day trip was in March 1991 when we went to the Swanage Railway, at the time of our visit the Swanage Railway was suffering from financial problems and they were in the brink of closing by Easter 1991. 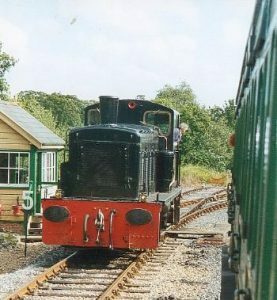 The return ride was for six miles from Swanage to Harman’s Cross and back, which at the time was the limit of the line. We used their disabled coach, which was re-built from an Mk 1 coach with wide doors and a disabled toilet inside the coach. We all loved the coach very much as it had lots of room and had chairs, which can be moved around in the coach. 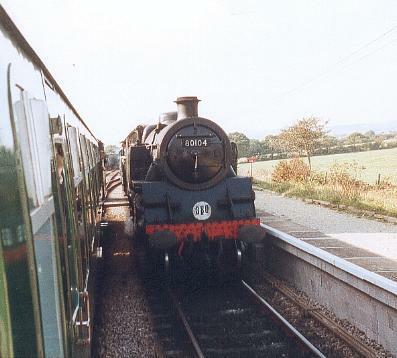 Swanage 1991 – Another view from the train. Note the early spring sun. Departing Harman’s Cross for the journey back to Swanage. 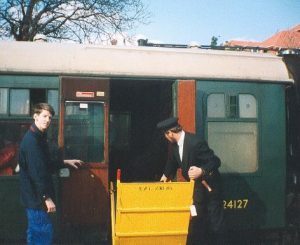 The guard opening up the ramp for us to get out after arrival at Swanage as Adrian looks on. 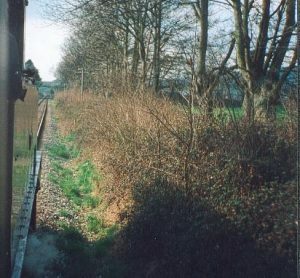 Isle of Wight 1992 – Army No 198 runs round the train at Wootton for the return journey to Smallbrook Junction, via Haven Street. 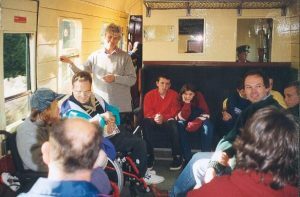 In July 1994 we went to Didcot Railway Centre, which is locally about 10 to 15 miles south from Oxford to their special disabled steaming. Didcot is a problem once you get there, as there is a fight of steps from the end of the station subway up to the disused railway yard. Once in the Railway Centre there are level access to most areas with paths and a disabled toilet. In the past they used the crossing from the Parkway car park, but due to safety reasons they weren’t allowed to use it again. 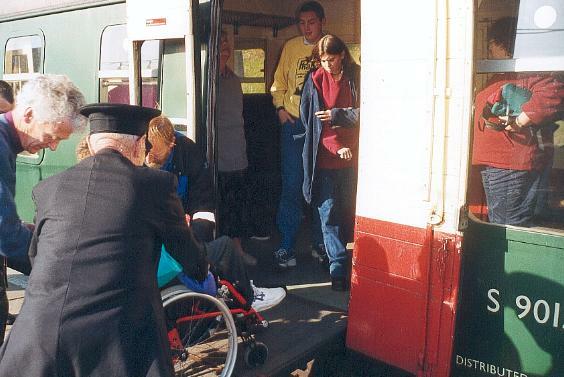 For this special day to allow more disabled people to visit Didcot, the Great Western Society (GWS) who run the Railway Centre used a Thames Trains Turbo DMU, which was crewed by Thames Trains staff. They had to get special permission from Railtrack for the shuttles to be run on busy lines. 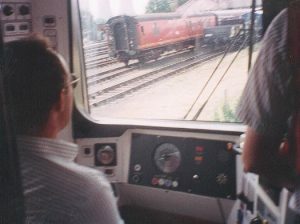 The Turbo ran special free shuttles from Didcot Parkway Station, ran up the main line towards Reading for a mile before stopping. Then the driver changed ends and rang the Slough signalman to change the points and unlock the Railway Centre’s main line connection. We went from the fast lines via the slow lines then into the point that goes into the Railway Centre, which we had to go slowly through the gates then into the Railway Centre’s main demo line. We then stopped while the GWS staff changed the points and once done the DMU slowly arrived into the platform. Everyone got off and spent 4 hours looking at the steam engines in the shed, had a short ride on the branch line, looked around the Centre. 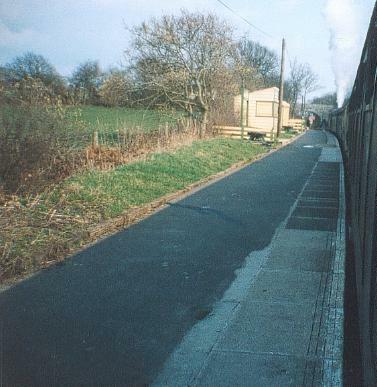 The DMU had a break in one of the shed roads so the GWS could run their steam train on the demo line. After about two hours later the DMU started doing the shuttles again, taking the disabled people back to the Parkway Station. I managed to have a ride in the cab as the door was open and the driver was kind enough to allow me to have a look while the DMU was on the move. Since then there has been no special disabled steamings, mostly because it has been quite difficult to put another shuttle on the main line as it would of course delay other trains without special permission. The GWS also does not have a Safety Case to run it. Last year there has been good news, the GWS has plans to replace the subway steps with a new ramp after it leased extra railway land, in which they hope to buy together with the main site which is also leased. 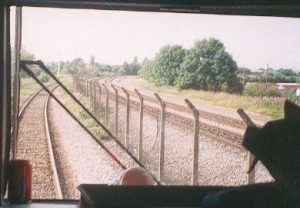 Didcot 1994 – A driver’s eye view of the Railway Centre’s main line demo line, taken from the Thames Train Turbo whilst going back to the Parkway Station. Our driver for the special free shuttles from the Parkway Station to the Railway Centre. 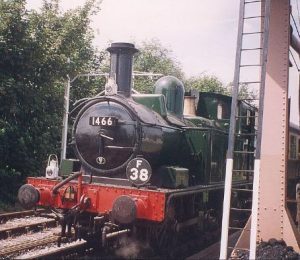 No 1466 stands whilst on a break from running on the Branch Line. 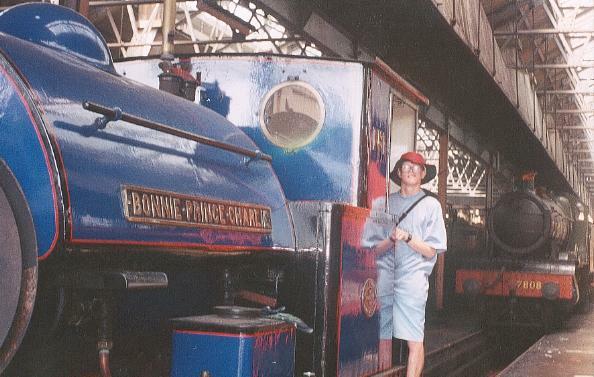 Simon standing on the cab of Bonnie Prince Charlie in the engine shed. 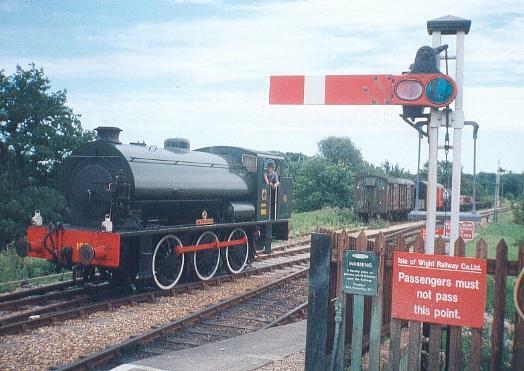 In August 1996 we went again to the Isle of Wight Steam Railway, we used the same coach as in 1992, but with a slightly improved ramp, which was built by the railway. Our ride back to Smallbrook Junction from Haven Street via Wootton had to be hauled by the railway’s standby Class 03 diesel shunter, No D2059 after Army No 198 Royal Engineer failed with a sight problem. We enjoyed it very much. After getting off the Island Line train at Smallbrook Junction, the group are seen having their lunch whilst waiting for the steam train to arrive. David, Adrian, Louise, Mary, Steve and John are seen on the photo. 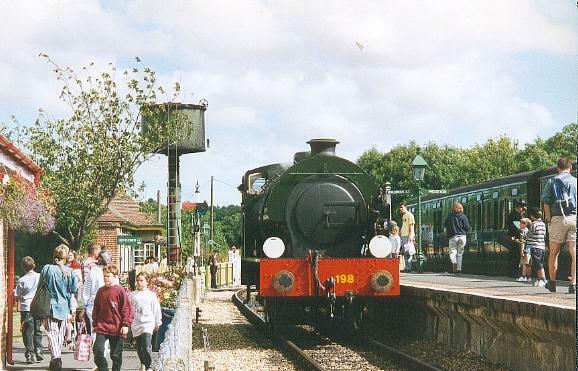 Just as we were about to go back on the train, No 198 failed with a slight problem and was unable to take our train. They had to put on their standby Class 03 diesel shunter into service. Taken at Haven Street. At Wootton Class 03 No D2059 runs around the train for the journey back to Smallbrook Junction. 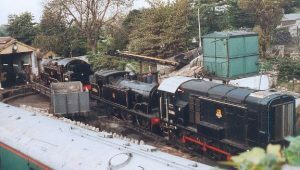 In October 1999 we went again to Swanage, this time the Swanage Railway had cleared of their financial problems and they were now running trains to Corfe Castle and Norden. This meant we had a longer ride on the train, which was a 12 mile round trip. The disabled coach we used in 1991 was out of service and stored in the loop at Herston, so we had to use their other smaller disabled coach, which was not good as the other one, but we all enjoyed it as we had lovely weather on the day. 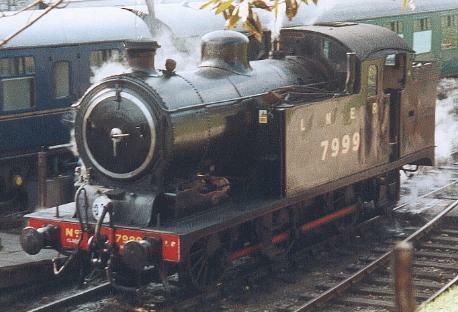 Our train was hauled by a visiting steam engine No 7999. It was a two train service, so we had to wait at Harman’s Cross to allow the other train which was hauled by No 80104 to pass while on our way to Norden and stop on the way back to Swanage. 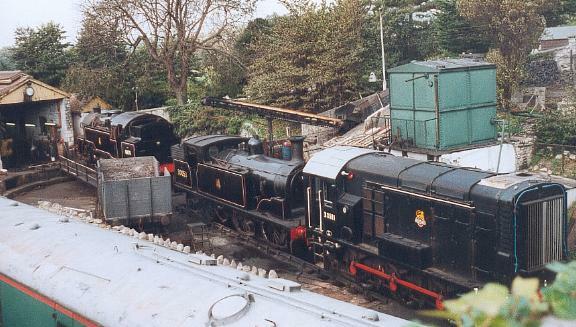 A view of Swanage engine shed and turntable, from left Std Tank No 80078, M7 No 30053 and Class 08 diesel shunter used as station pilot. Visiting N7 No 7999 is seen taking water ready for our train to Corfe Castle and Norden. Std Tank No 80104 is seen passing our train at Harman’s Cross station, which is now a passing point for a two or three train service. 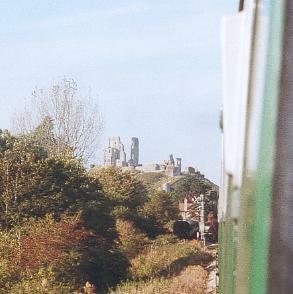 Corfe Castle (on top of hill) seen from the train. Our group on the smaller coach, seen on the photo from left Colin (back of head facing camera), Jackie, Adam, Pam, Ross, Katherine, John, Nick and Mary (back of head facing camera). Another view of our group Katherine, Alan, John and Howard can be clearly seen. Adam is seen being unloaded from the coach helped by Howard, Steve and the guard after arrival back at Swanage. I plan to try and do another day out this summer, hopefully to the Severn Valley Railway. I have also added some photos of our past trips. I hope you enjoy them.